Consequently, for a satellite in an equatorial or low-inclination orbit, the right ascension is the easier to control. Note that the declination terms B, and Bb in Eq. (H-30) oscillate with a frequency of twice the orbital period. 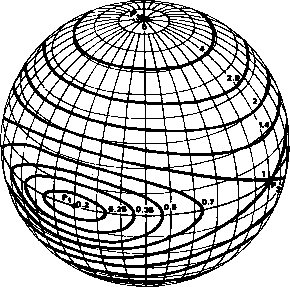 That is, the direction of the magnetic field in the orbit plane system rotates through 720 deg during the orbit. Thus, Bj and Bb change signs four times during the orbit. Declination motion then can be obtained in a certain direction by switching the polarity of the magnetic control coil four times or every quarter orbit. This is the basis for QOMAC control theory. If the satellite has a residual magnetic dipole, the B„ term will cause a secular drift in right ascension and the B„ Bb terms will cause an oscillation in declination at twice the orbital period and a diurnal oscillation in declination due to the rotation of thé Earth. 1. Leaton, B. R., "International Geomagnetic Reference Field 1975," Trans., Amer. Geophysical Union (E®S), Vol. 57, p. 120, 1976. 2. Chapman, Sydney and Julius Bartels, Geomagnetism. Oxford, Clarendon Press, 1940. 4. Jackson, John David, Classical Electrodynamics. New York: John Wiley & I Sons, Inc., 1965.